7	The Diamond Awards (recorded on 19 November 1988) are broadcast on UK TV. 8	"You Are The One" reaches its highest position of number 13 in the UK charts. 10	The nominations for the Spellemannspris '88 are published. a-ha are nominated for their album "Stay On These Roads" in the "Pop" category. 18	a-ha fly to New York to work on their next album which has a working title of "Beginning Middle End". 29	"You Are The One" spends its last week in the UK top 75; a total of 10 weeks. 11	Morten Harket marries Camilla Malmquist in a little church outside the Swedish town of Falun. Veronica Flåt and Dennis Storhøi are interviewed on Norwegian "Frokost-TV", a glimpse of the film "Kamilla og tyven II" is shown. 16	The film "Kamilla og tyven II" (sequel to "Kamilla Og Tyven"), which also features Morten, premiers in 26 towns in Norway. This film is based on books by Kari Vinje, but the plot was written by Kristin Bjorvand and Grete Salomonsen Hunnekleiv. Kari Vinje says that she wants to write another book, based on the new things from the film. 17	In Bern, Switzerland, there is an exhibition of solar cars which was initialised by The International Solarenergy Association. Bellona takes part and both Morten and Mags are there to present some of the solar cars. Morten is interviewed by French TV for "Top 50 Perestroika". 18	Morten is interviewed by Hilde Hummelvoll for Norwegian "Frokost" TV and reveals that he and Camilla are having a baby soon. Clips of the Solar-fair in Bern where Mags and Morten are driving solar cars are also shown. 25	The Spellemannspris '88 takes place at the Oslo Konserthus. a-ha's album "Stay On These Roads" is nominated in the "Pop" category. Also nominated in this category are Dance With A Stranger and Bjørn Eidsvåg. The award goes to Dance With A Stranger. 6	a-ha arrive at Galeao airport, Rio de Janeiro, Brazil. Rio's Norwegian ambassador, Carl Helge Guldbakke, is impressed by the reaction a-ha provoke in Rio: radio, TV and newspapers are full of interviews and concert adverts; Norwegian flags are everywhere; a large number of fans hang out in front of the band's hotel; the concert sold out immediately and an extra concert had to be set up. a-ha have a very busy programme in Rio: with the the ambassador, they visit the Norwegian princess Ragnhild and her husband Erling Lorentzen at their home; they go on a boat trip with Haakon Lorentzen and his wife (who also go to the concert). The ambassador thinks he is too old for the concert and sends his secretary. 7	a-ha are interviewed at a press conference and get a gold record. 9	On the beach of the Grunari hotel, a-ha film some scenes which are later shown on "Rede Globo" TV. 10	Praça da Apoteose, Rio de Janeiro, Brazil; at this concert there is a small backstage electrical fire which affects the sound. Approximately 80,000 people attend. The set list for the South American tour includes Cry Wolf, Here I Stand and Face The Rain, Touchy!, Manhattan Skyline, Scoundrel Days, This Alone Is Love, The Sun Always Shines On T.V., Hurry Home, Hunting High and Low, The Swing Of Things, The Blood That Moves The Body, Out Of Blue Comes Green (only in the first show, then replaced by You Are The One), Take On Me, I've Been Losing You, And You Tell Me (included from the second show), The Living Daylights, Stay On These Roads. 11	Praça da Apoteose, Rio de Janeiro, Brazil, approximately 80,000 people attend. 13	The scheduled concert in Porte Alegre, Brazil is cancelled because of the extra show in Rio on 11th; instead they play	"The Blood That Moves The Body" and "Touchy!" privately at a disco in a hotel called Skylyb in Rio. 15	a-ha arrive in São Paulo, Brazil. 16	There is a Press Conference in São Paulo. 17	Estádio Parque Antártica, São Paulo, Brazil, approximately 70,000 people attend. 18	Estádio Parque Antártica, São Paulo, Brazil, approximately 70,000 people attend. 19	Estádio Parque Antártica, São Paulo, Brazil, approximately 50,000 people attend. 20-31	After the Brazilian tour, Morten goes to Acre (near the border of Bolivia and Brazil) to spend time in the Rainforest with the Rubber tappers. He invites journalist Jan Omdahl to join him on this tour. Even in the jungle, as far away from civilisation as possible, Morten still gets recognised and is asked to sign autographs. 21	Pål and Mags fly back to London. 24? The Royal Variety Show, recorded in London on 21 November 1988, is broadcast on Norwegian TV at Easter. One of the concerts in Sao Paulo is broadcast on the Radio station "Trans America FM". The album "On Tour In Brazil" is released in Brazil to coincide with the tour. It sells 640,000 copies; despite the title, this Brazilian only LP is a compilation of album tracks and not a live album. 10	"You Are The One" is released in Japan on 3" CD. 28	There is a "Frokost-party" (party for the programme "Frokost-TV") where Morten and Prime Minister, Gro Harlem Brundtland, meet for the first time. 29	Morten and Gro Harlem Brundtland both appear on the Norwegian TV show "Frokost TV" (NRK). They announce a special, "Vår Felles Fremtid" ("Our Common Future"), on the environment which will take place on 3 June 1989 and a-ha are due to participate (but don't in the end). Morten is due to go to Cannes to promote the film "Kamilla og tyven II", which has been shortened by 10 minutes and given English subtitles. Since Camilla is expecting her baby, he does not go. In Cannes, Penelope Film signs a contract with Filmstar to take the film to Argentina, Germany, Turkey and Spain; the producer expects more countries to sign a contract with during the festival. He will also dub the film into English, which should be ready for Cannes 1990. 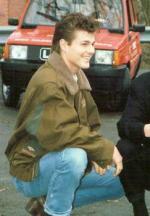 14	Morten's son, Jakob Oscar Martinius Harket, is born in London. 3	A worldwide environmental TV special "Our Common Future" takes place. Artists from over 100 countries do concerts around the world and politicians lead the TV show. In Norway, Gro Harlem Brundtland organises the TV special which lasts for several hours. Sissel Kyrkjebø is amongst the artists. On Frokost TV in May, Morten said a-ha might be involved, but due to practical problems they are not. 15	The Norwegian press gets to hear that a-ha are deeply involved in a project that fights for the desert in Africa. The project is called "The Green Belt Movement" and is operating under the Worldview International Foundation. The goals are to plant trees and to buy solar cookers for the inhabitants in Kenya, so they do not cut down trees and burn more wood. a-ha support this project with a large sum of money and are supposed to go to Kenya to watch over the project. 18	At the lake of Holmenkollen ski jump in Oslo, the watergames "Ta sjansen" take place. It's 30 degrees, sunny and 30,000 people are watching. Mags and Morten, together with Frederic Hauge of Bellona, are part of the jury. In order to get to their platform in the middle of the lake, they ride on a special vehicle (the "Maledives"), over a jump and across the lake. A children's choir sings "Take On Me" while they cross the lake. It's an "environmental vehicle", used to attract attention and get donations for the tree planting project. Frederic Hauge is advertising for projects to reduce the "greenhouse-effect" in Norway. 8	A special about "Ta sjansen" is broadcast on Norwegian TV (NRK). 26	The Norwegian newspaper "Aftenposten" reports that Morten is involved in advertising the Norwegian "Setesdal" sweater abroad. 2	Morten is in Drammen, Norway to try out his new Mercedes 500 SL. He invites the press for a little press conference in connection with the car. He says that environmentalists could be provoked if they see him with this car, but since solar and electronic cars are not allowed on Norwegian roads or produced in mass-production, he has to stick with a normal fuel-car. It's not long before the first critics appear in the newspapers (including "Dagbladet" who, two weeks later, buys the same car as their representative car for the newspaper!). 4	The Giffoni Film festival takes place in the South Italian town of Giffoni. Morten and the Italian Prime Minister Giulio Andreotti get the "Fran&ccdil;ois Truffaut film award" for their support of children's films. Morten's award is for his part in the "Kamilla" films. In the past, this award has gone to Paul Newman, Marcello Mastroianni and Shirley McLane. 11	In Skaugum, Asker, the National Scout Meeting takes place from 5th until 12th August. Over 19,000 scouts from 25 countries attend and Morten is a surprise visitor there as he was once a cub scout. He is smuggled in early evening, mingles with some of the scout leaders and signs autographs. Later in the evening, he joins Bjørn Eidsvåg who is doing a concert. Morten and Bjørn sing "Bye Bye Love", "Let It Be Me" and "Det Er Ennå Tid" while the camp fires burn. Silje Nergaard, Sigvart Dagsland and Mortimer & The Pancakes sing in the choir together with the 19,000 scouts. A cassette "Det Er Ennå Tid" featuring different artists was sold earlier in the year, the profit from the sales go to environmental projects. The album includes the track "Det Er Ennå Tid" ("There Is Still Time") sung by Morten and Bjørn with the Oslo Gospel Choir.Morten is interviewed for the French TV show "Perfecto" at the scout camp. 13	Jakob Oscar Martinius Harket is baptised in Norway. In Dvergsnestangen, Norway, Morten and Bjørn sing at another scout camp. 29	The Norwegian newspaper "Aftenposten" reports that there won't be a new a-ha album ready for 1989, but WEA will release a compilation album which is due for release in time for the Christmas market. The album would probably be "So Far" and would be a collection of mainly album tracks rather than just the hits plus a new song. The record company was planning big promotion for this album, but it was never released. Mags and Pål work on new demos, while Morten travels to Japan, Hawaii and California in connection with his solar energy projects. 1	Morten, two members of Bellona, Frederic Hauge and Bjørn Grennes, plus a member of the solar energy association in Norway, Harald Røstvik, fly from Oslo (via London and Anchorage) to Osaka to participate in a solar energy conference in Kobe. 2	At Osaka airport, Hauge gets caught with 6,7 grammes of hash and all are interrogated and have to wait for seven hours. Hauge has to go into custody at Toyonaka police station in Osaka. Hauge had a party before he left for Japan and picked up a cigarette packet which was lying on a table, he had no idea there was hash inside. Morten uses his connections in Japan to get Hauge a laywer. The police are not aware that they interrogated a famous popstar at the airport. 4	Morten, Bjørn Grennes and Harald Røstvik are again interrogated for several hours. Afterwards, they go to the solar energy conference. Morten remains in Japan to help Hauge and the Japanese press get to hear that Hauge was with the a-ha star Morten Harket when he was arrested. On the Norwegian kids' TV show "Verdenskalenderen", they talk about the environment and how to protect it. Included in this show is a recorded interview (from earlier in the summer) with Morten in the woods about the environment. 8	Morten is still in Kobe, Japan and is annoyed by an article in "Arbeiderbladet". They did an interview with Morten (with his consent) in Japan, but the story is changed with headline that Morten has a very liberal thinking towards drugs. Morten has always made it clear that he is against drugs in any form and thinks about seeing a lawyer to raise a case against Arbeiderbladet. 9	Morten and the other two Norwegians were due to leave Kobe today, but remain because of the Hauge case. 11	Morten, Bjørn Grennes and Harald Røstvik leave Japan and go to Hawaii. Frederic Hauge remains at the prison in Osaka. 12	A good friend of Frederic Hauge gets in touch with the police in Oslo and confesses that it was his hash in the cigarette packet which he accidently left at Hauge's party. 13	Frederic Hauge is released and expelled from the country. The immigration police put him on a flight to San Francisco. Morten, Bjørn Grennes and Harald Røstvik go to California and collect Frederic from the airport as they all want to see solar energy projects. 14	On his birthday, Morten goes with the others to the Californian desert, where they visit the big project "Solar One". Afterwards they head north of Los Angeles, where they visit the "Carrissa Planes" solar plant for a few days. Back in Norway, the police start their investigations. Although there won't be a trial against Hauge, but he might be called as a witness in the case. 18	Morten and the others return home from California. 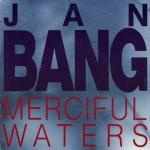 The album "Frozen Feelings" by Jan Bang is released in Norway. Morten sings backing vocals on the song (and later single) "Merciful Waters". 24	Morten joins more than 500 other runners on the "Barry Patmore Memorial Fun Run" in Wickford, UK to raise money for the Cystic Fibrosis Research Trust. 13-5 November	Magne has his debut painting exhibition "Maleri" at Sølvberget Galleri in Stavanger. Although Magne has enjoyed art for many years, the oil paintings, litographs and water colour paintings at this exhibition were mostly made during the last six months. 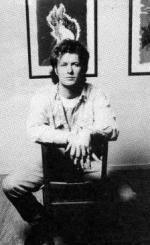 Magne says this was a kind of therapy for him after four very stressful years with a-ha. Magne's friend and colleague at the Henie Onstad Senter, Arve L. Opdahl, is the director of the gallery. Magne exhibits 24 pieces of artwork without the intention of selling them. He is advised to put the pictures up for sale as any other debut artist would. 13 of the paintings are for sale, while 11 are not available and listed as "in private possession". Most of the paintings are for sale at around 20,000-30,000 NOK. Some of the titles of the oil paintings include: "Tre Menn På En Ustø Flate", "Munchlandskap" I and II, "Portrett Med Gjøkur" and "Portrett i Bylandskap". The litograph "Anger" is available in 70 copies for 2,000 NOK each and there are some water colour paintings which cost around 5,000-6,000 NOK. 13	There is a reception evening in Stavanger at Sølvberget Galleri for 400 special invited guests. Magne also attends. 14	The official opening of the exhibition in Stavanger takes place, it will last until 5th November. During the first two hours, already 400 visitors have been to the exhibition and paintings and lithographs worth over 180,000 NOK have already been sold. Magne has requested that Morten and Pål don't turn up as he wants his artist-career to be independent of a-ha. 21	A charity event takes place at the Venneslahallen in Vennesla, Norway. At the end of the four hours, Morten comes on stage with Bjørn Eidsvåg, his father Reidar, his brothers Gunvald and Håkon, plus some uncles and cousins as a backing choir. Together they sing "Ein Fin Liten Blome". Morten and Bjørn Eidsvåg also sing songs by the Everly Brothers, The Beatles plus Simon and Garfunkel: "Let It Be Me", "Bye Bye Love", "All I Have To Do Is Dream", "Be Bop A Lula", "Twist and Shout" and "Crying In The Rain". The profits from the event goes towards the preservation of the Vigelands Herregård. Morten pays all the costs of the performance. He feels connected to this town as his grandmother Olga Harket and lots of relatives and friends live there, plus he has spent most summers there since he was young. 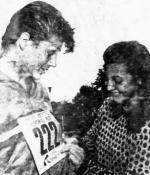 Morten also does an interview for a Vennesla school magazine, writes autographs and poses for pictures. A cassette featuring songs from the two "Kamilla"-movies is released in Norway. 2-5	The "Nordische Filmtage" (Nordish filmdays) take place in Lübeck, Germany. It's the biggest festival of Nordish films and the "Kamilla og tyven II" film is shown at the festival. During 1989, Pål and Lauren get engaged in Cape Cod, USA.